Last year, DogTime.com told you about the amazing “End of Watch” tribute another Massachusetts police department paid to their K-9 officer, German Shepherd Kaiser, who was put to sleep in June after vets discovered the 2-year-old canine crime fighter was suffering from severe kidney disease. Today, Massachusetts State Police officer Christopher Coscia’s poignant message to his late canine partner, Dante, is making headlines and bringing tears to the eyes of dog lovers all around the world. For nine wonderful years, Trooper Coscia and Dante kept the streets safe together. But when Dante recently started suffering painful seizures and was diagnosed with pulmonary hypertension, Coscia made the difficult decision to say goodbye. Dante was put to sleep January 2. Though his friend was gone, Coscia wanted to make sure that everyone remembered Dante for the extraordinary dog he was. In a letter Coscia titled “One Last Ride,” which Coscia wrote during his final ride in the cruiser with Dante, the heartbroken but proud officer paints a moving picture of Dante and gives the world a glimpse at what it is like to grieve the loss of a four-legged friend. “I write this story with tears in my eyes and flowing freely down my face,” Coscia says. 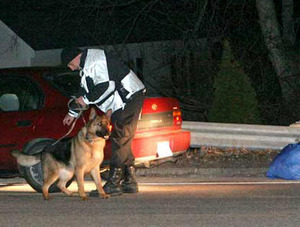 Dante, Coscia says, was a “one-person dog,” meaning that he was trained to bond only with his human handler. But just because Dante was hard for others to get to know, Coscia says he treasures the friendship they shared. Dante, a large black-and-tan Shepherd, was a beautiful dog and certainly a sight to see. But even more memorable, Coscia says, was his dog’s disposition. But Dante’s main target was drugs, says Coscia. “During his career he helped to rid the streets of drugs,” Trooper Coscia writes of Dante. “He was able to locate and assist in the seizure of more than 1,000 grams of Heroin, more than 8,600 grams of cocaine (one seizure alone of more than 7 lbs. that had been canned mechanically), more than 1,000 lbs. of marijuana, and more than $14,000,000 in cash,” remarkable work for man’s best friend. Dante also made for the perfect companion while patrolling the streets, Coscia remembers. Wanting nothing more than to be close to his favorite person, Dante figured out how to open the door to the cruiser’s partition. “While on patrol he would occasionally stick his head through for his occasional ear rub,” Coscia says fondly. As Dante’s health started to fail, and after veterinarians broke the sad news that Dante would not recover, Coscia says he delayed the inevitable for eight long hours, content to enjoy one last ride with his beloved dog. The Massachusetts State Police decided to share Coscia’s letter on their Facebook page. In only a few short days, “One Last Ride” has been shared more than 14,000 times and has earned more than 24,000 likes. People from around the world posted messages of comfort and condolences to Trooper Coscia for his immense loss.